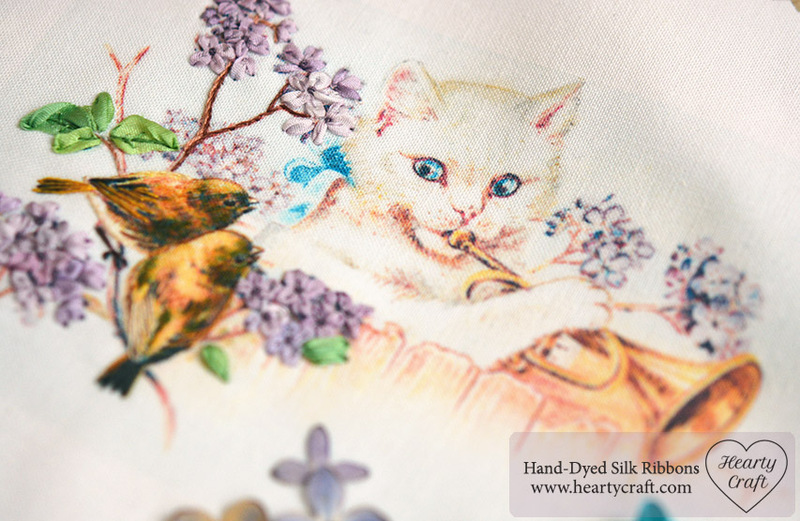 After digging through a pile of vintage postcards to pick out some for printed backgrounds I sell, the first thing I usually do is checking whether the image looks good on fabric and if there are enough details to stitch with silk ribbons. Sometimes I stitch over a tiny piece of print just to fulfill my curiosity and check out how it would look like if embellished with ribbons. However, once I started stitching on this postcard, I just could not bring myself to stop until it’s been completely done. It’s absolutely stunning postcard, I love that cheeky musician puss hypnotising birds. Look how stunned they are with its beautiful play. Totally paralysed! It was very hard to resist the temptation, but I stitched only foreground and left the cat figure untouched. I didn’t even tie a bow around its neck which was very tough decision to make! I managed to convince myself that it would throw it out of balance by confusing details at the back with the foreground. As for the birds I added a few stitches here and there on their bodies, highlighted feathers on wings and tails, stitched their eyes, and that’s it. That’s not a lot of stitching, but it made the birds standing out. 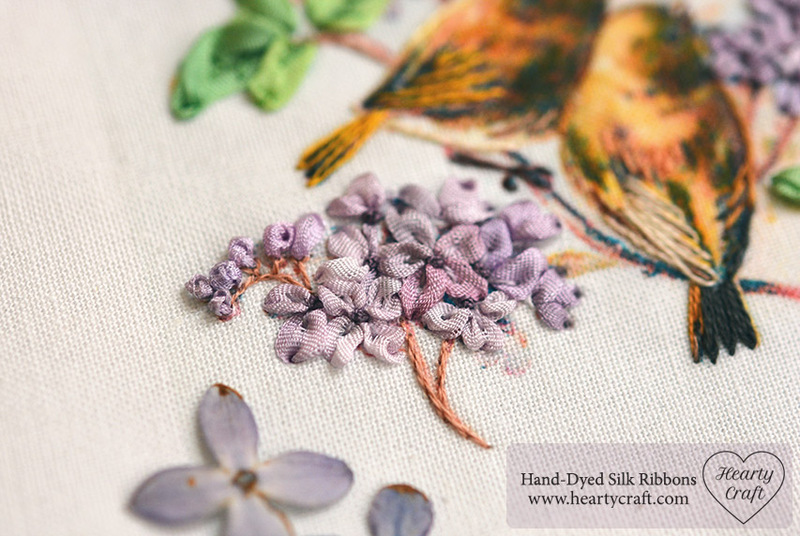 Lilac is stitched in silk ribbon embroidery technique and basically there’s only one stitch with ribbon is used for flowers here — it’s straight stitch. I used 4mm wide ‘Lilac’ silk ribbon for petals and 2mm wide ‘Lilac’ one for buds and tiny flowers. Leaves are worked with 7mm wide ‘Apple Green’ silk ribbon and ribbon stitch. 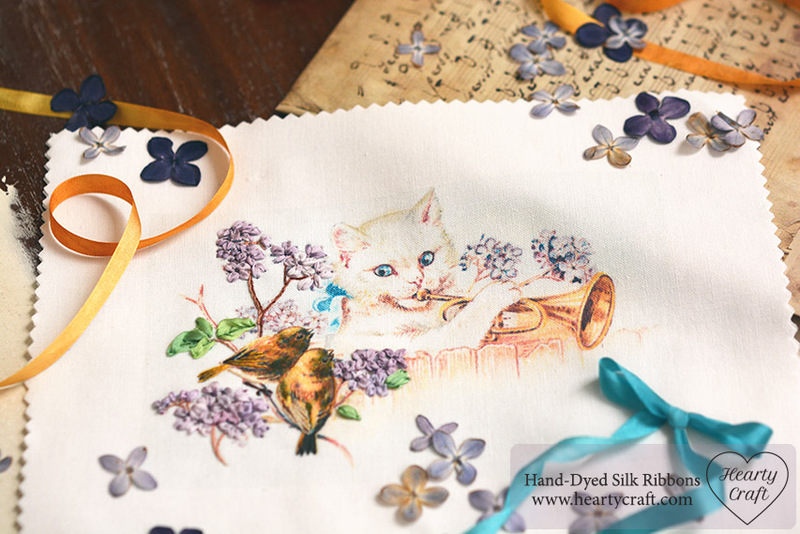 If you want to make such a lilac flower looking similar to mine, stitch four straight stitches with the silk ribbon following the pattern on the background. Some flowers are hiding behind the others, they will have three or even only two visible petals. Also for some reason there are a few flowers even with five petals here. When the petals are done, take one strand of embroidery floss in pale violet and stitch a short straight stitch on top of each petal starting from the flower centre. 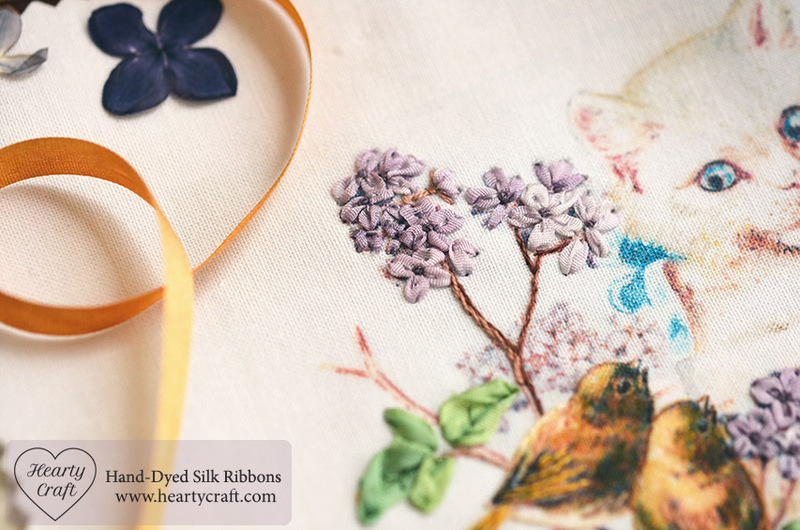 Finish each flower with a French knot placing it in the flower middle and using two strands of embroidery floss in darker shade that the silk ribbon. If you like the print, follow the link to order it or to browse all our printed backgrounds. 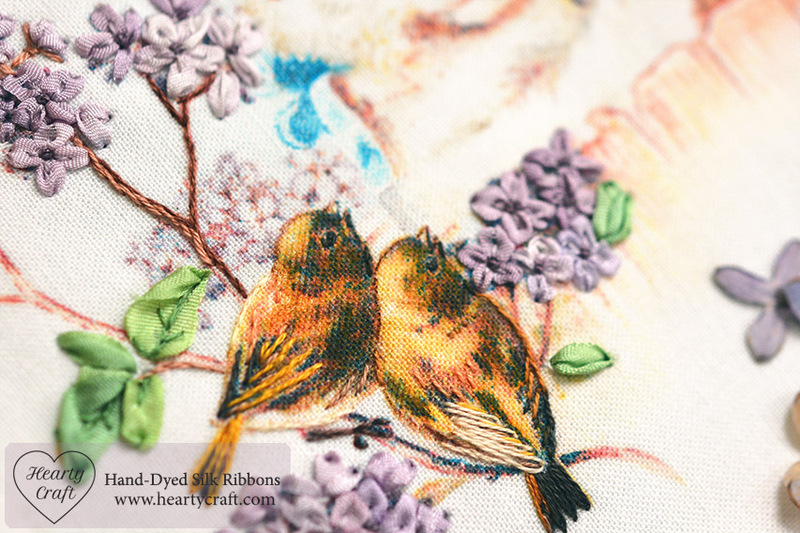 This entry was posted in Blog Posts and tagged Inspiration, Patterns, Prints, Silk ribbon embroidery on 29th May 2015 by Zinaida.